Please be sure to hit your RELOAD button each time you visit to ensure that your are utilizing the most current version of this page. Also be sure to bookmark this page and visit it often as possible as this page will be changing on a regular basis as I find more information to add. If you have any problems or any question with this page, please let me know. 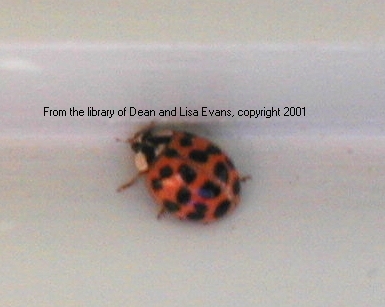 Now...On To The.Ladybird Beetle Pictures. 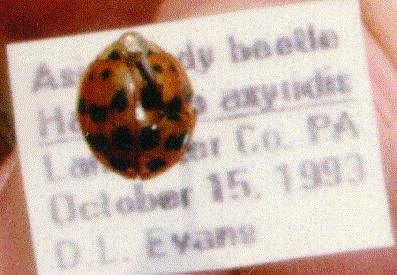 This is a close-up of the first specimen of the Asian Ladybird beetle to be found in Pennsylvania, October 12, 1993. 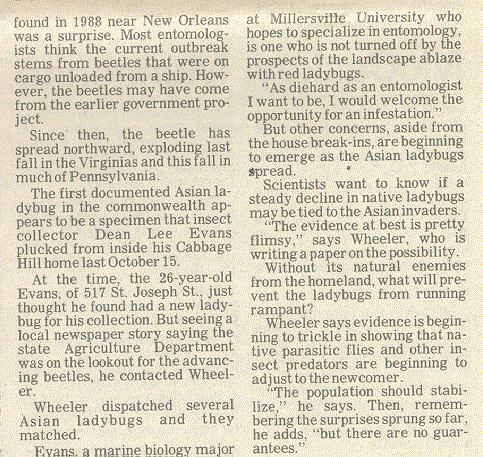 A photo of me and the beetle appeared in the Lancaster New Era on October 28, 1994. This photograph came from the same article. This is a passage from the article pertaining to my discovery of the insect. 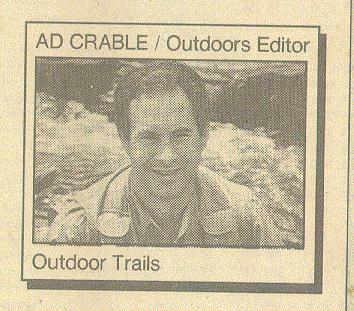 This is the photo of Ad Crable, the author of the story. Ad is an avid outdoorsman who writes wonderful articles about many nature related stories. This is a close up uf the specimens sent to me from the Pennsylvania State Department of Agriculture. 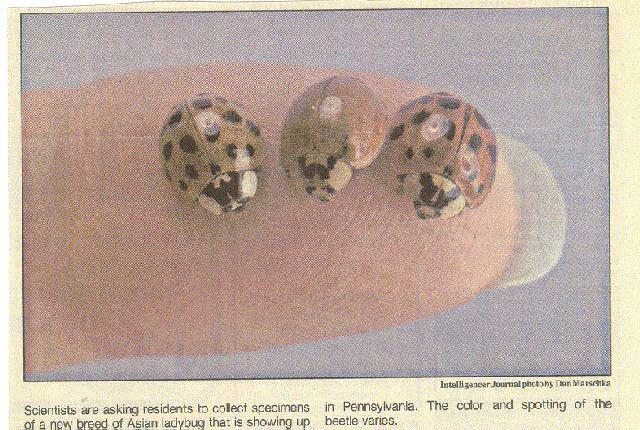 This photo is from the newspaper story alerting residents of Pennsylvania to keep an eye out for this beetle. This article is from the Lancaster Intelligencer Journal, February 20, 1994. Page 2. 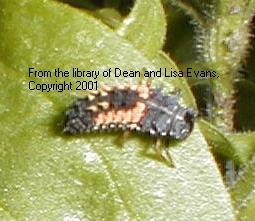 This is a page from an Australian website pertaining to the Australian ladybird beetle with reference to the Asian ladybird beetle. Page 3. This is a page from a University of Massachusettes at Amherst edition of their Campus Chronicle pertaining to the Asian ladybird beetle. Page 4. This page is from a biology database of several different topics including job openings, however, it did have an article about an Asian ladybird beetle invasion in Illinois. Click here. This link to the University of Michigan contains a brief paragraph on the origin of the ladybird beetles name, physiology, and a very useful taxonomic key with graphics. Although ladybird beetles are not carrion eaters like many other beetles, I feel this page is a must because it deals with one of the least talked about aspects of entomology there is, and a very favorite interest of mine - forensic entomology, the study of insects on dead bodies. Be warned. This site is of a professional nature and not for the weak stomach types, but it is an excellent and highly informational site. 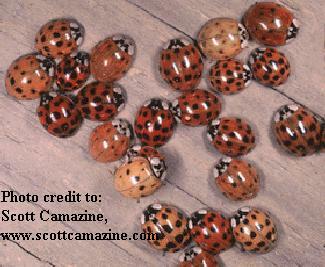 If you have any questions about ladybugs or other beetles, please feel free to write. Do to the amount of mail I receive, all questions will be answered on my Q and A page at the link below. Your answer should appear within 4-6 weeks, so check back from time to time. Also, in your e-mails, please let me know how you found my site. With search engines returning so many choices, it helps me know what I can do to make it easy for others to find my webpage. Thanks!! Please note that submitted questions at Ladybug Q & A page will have all names and e-mail addresses ommitted, but if you would like to contribute and be available for people to contact you, simply state that your permission is granted to use you name and e-mail address. Please do not let this discourage you from writing. I am doing this so people visiting this site can read letters of concern or comments from other people. Your comments and experiences are important. Be sure to check out my website on Ticks and Disease. Can you contribute to this? E-MAIL ME! Do you have a subject that you think should be featured here? Please let me know and I will see what I can do about covering the topic (as long as time and space permit). Click here to return to main homepage.